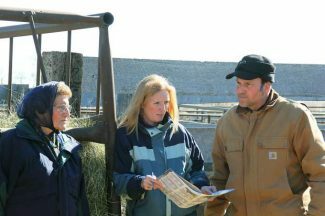 Labrier Ranch, Murdo, South Dakota, purchased Deep Creek bulls. They also sold an extra fancy set of open replacement heifers at the sale. 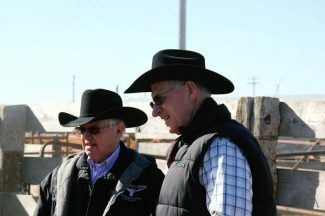 Billy Markwed, Midland, South Dakota, and Alan Knippling, Gann Valley, South Dakota, looking over the Deep Creek Angus bulls. 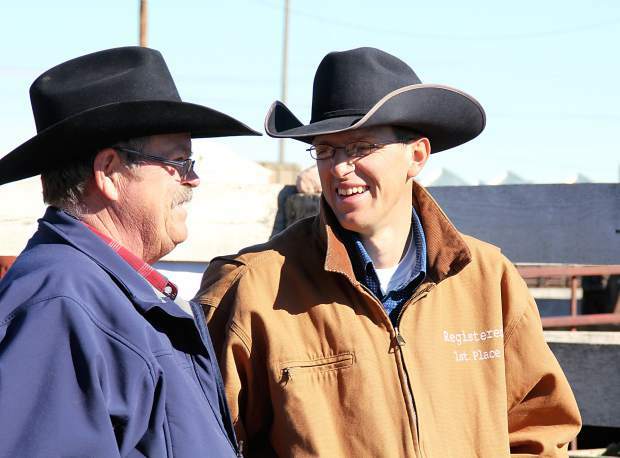 Steve Mowery, Ma & Pa Angus purchased a Connealy Reflection son at the Deep Creek Angus sale. Marty Kinsley, Murdo, South Dakota and TJ Gabriel, Deep Creek Angus looking over the bulls. 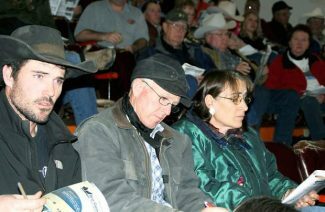 Eda, Betty and Lyle Haase, Valentine, Nebraska, at the Deep Creek Angus sale. What a fantastic day for TJ and Jeanine Gabriel and family when they held the 16th Annual Deep Creek Angus bull sale at Philip Livestock, Philip, South Dakota Feb. 24. 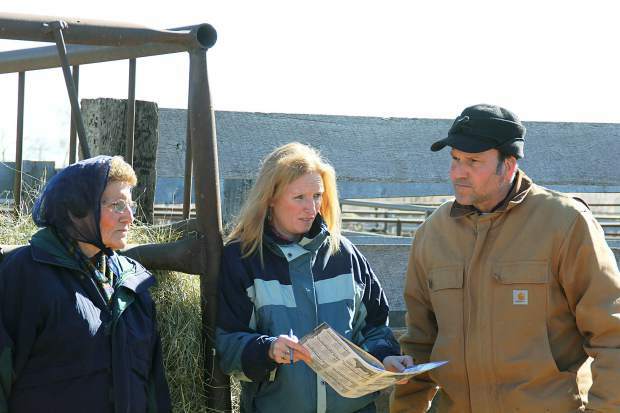 The cattle were in excellent condition, the weather was great and the huge crowd of buyers came with one mission in mind, to own a Deep Creek Angus bull. 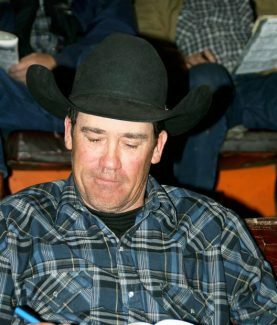 Since he started out in the purebred business, TJ has never chased fads or the bull of the day in the breed. He has always stayed true to the cowherd and philosophy of breeding sound functional cattle that will cover all the bases of the cattle industry. These bulls were thick, structurally correct, easy fleshing and have generations of great maternal traits bred in. Topping the sale was lot 1, Deep Creek Doc Holiday 433, a Jan. 23, 2014, son of Tombstone 050. This bull had a moderate birth weight of 80 pounds, but went on to wean off at 797 pounds, with a weaning ratio of 109. Yearling weight of 1,416 pounds, to ratio at 111 and has epds of BW 1.2 WW 66 YW 110 Milk 32. Charles Tennis, Vale, South Dakota won the bidding war to own the bull at $20,000. Selling at $19,000 was lot 2, Deep Creek Revolution 417, a Jan. 23, 2014 son of Connealy Reflection that had a 205 day weight of 761 pounds, 365 day weight of 1,374 pounds, and epds of BW .4 WW 50 YW 83 Milk 26. Ma & Pa Angus, Presho, South Dakota was the winning bidder. Charles Tennis struck again on lot 3, Deep Creek Gusty 402 for $18,000. This Jan. 7, 2014, son of VDAR Really Windy 4097 had an 846 pounds, 205-day weight, to ratio at 116 and 365-day weight of 1,334 pounds, to ratio at 105. The bull posted epds of BW .3 WW 66 YW 98 Milk 20. Lot 5, Deep Creek Springsteen 409, a Jan. 29, 2014, son of Deep Creek Rock N Roll with epds of BW 2.5 WW 58 YW 91 Milk 22 sold to L. B. Haase & Sons, Valentine, Nebraska, for $18,000. Selling at $16,000 was lot 17, Deep Creek Windy, a Jan. 12, 2014, son of VDAR Really Windy 4097 with a 108 weaning ratio and epds of BW -.3 WW 52 YW 85 Milk 21. Charles Tennis was the buyer. Booth Ranch, Timber Lake, South Dakota selected lot 11, Deep Creek Chisum 427, a Jan. 29, 2014, son of S Chisum 6175 with epds of BW 2.1 WW 62 YW 102 Milk 22. 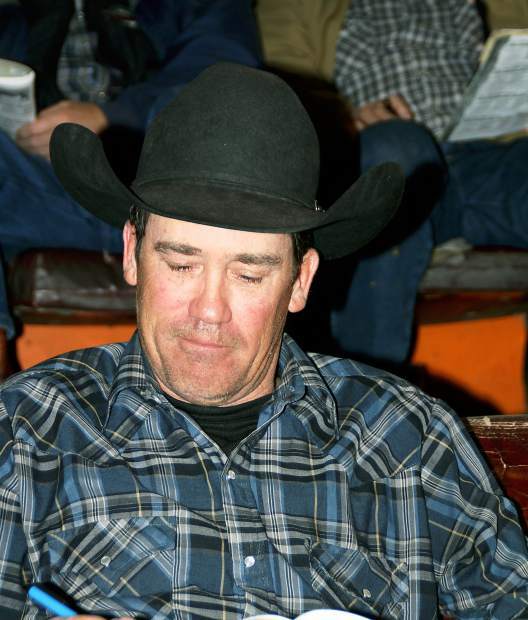 This bull had a 205-day weight of 750 pounds, and 365-day weight of 1,395 pounds, and sold for $15,500. Customer service at Deep Creek Angus is a number one priority. TJ Gabriel takes the responsibility of supplying seedstock to their friends and neighbors very seriously and will do whatever it takes to make a satisfied customer.